Violent extremism has become a major threat to international peace and security. The global character of this phenomenon reflects in its unselective nature. The fact that violent extremism is not linked with a specific state, civilization or ideology, makes it a global phenomenon and capitals from Oslo to Cairo, Riyadh to Kuala Lumpur and London to Washington are actively dealing with this menace. No region or even country can claim to be entirely safe. In the threat spectrum, individuals and groups with diverse ideologies and interests present single major threat to international security. In response to this multidimensional and multifaceted problem, approaches that rely on military force have dominated the global counter terrorism agenda. Catch, kill, and disrupt strategies, which have been applied by multiple countries, have not always led to an appreciable reduction in threat. The effects of military action and state repression on the population have often further radicalized individuals and increased support for extremist groups among general population. Though the operational capabilities of threat groups have been minimized, the intentions and goals remain intact. Recently, however, the growing awareness of the above mentioned problem has led to an upsurge and interest in more comprehensive counter-extremism policies. Saudi Arabia, Singapore, Malaysia, Indonesia, Yemen, Turkey, Iraq, Sri Lanka and some Western European countries have implemented or proposed, what broadly known as the de-radicalization and counter-radicalization programs. These innovative counter terrorism tools have gone beyond the strategies that rely on use of military force, harsh repression and detention of suspected extremists and terrorists; instead these state-directed efforts to change the ‘hearts and minds’ have led convicted and suspected terrorists to express remorse, repent, renounce their violent ideologies and re-enter mainstream positive activities in the society. The terms de-radicalization and counter-radicalization, which are often used as alternatives to each other, have different meanings, when they are applied practically in field. According to John Horgan’s definition, which has also been adopted by United Nations Working Group on Radicalization and Extremism that led to terrorism essentially means “the programmes that are generally directed against individuals who have become radical with the aim of reintegrating them into society or at least dissuading them from violence.” In simple, de-radicalization seeks to reverse the radicalization process for those already or partly radicalized. In contrast, counter radicalization is defined as “a package of social, political, legal, educational and economic programmes specifically designed to deter disaffected (and possibly already radicalized) individuals from crossing the line and becoming terrorists.” In other words, counter-radicalization seeks to prevent individuals and groups from becoming radicals. Saudi Arabia’s counter terrorism program, which is a mix of de-radicalization and counter-radicalization tools commonly known as “PRAC” (prevention, rehabilitation and aftercare) has proven successful so far in countering the violent extremism. In 2003, there was a wave of attacks by Al-Qaeda terrorists on Arabian Peninsula, a campaign of bombing, targeting specifically the Western companies within the Kingdom. In response, Saudi Arabia aggressively launched de-radicalization and counter-radicalization campaigns to efforts extremists eventually began targeting the Saudi national security apparatus. According to open source knowledge, there were 61 violent confrontations between terrorists and Saudi security forces only in 2003 and 2004. Nevertheless, Saudi Security Forces have remained successful in managing its deradicalization campaign. As since 2006, there has not been any successful attack on the Saudi Security Apparatus by the terrorists. In Singapore the government directed efforts have mainly concentrated on a multi-pronged rehabilitation approach involving several different partners including the government and various sectors of the community. Meanwhile in Yemen, where guns are considered to outnumber people and sectarian conflict is at its peak, the government has undertaken an unorthodox approach to deal with detained extremists and militants, usually known as ‘prison based de-radicalization’. Pakistan, the hardest hit victim of extremism, has been fighting the menace of terrorism and extremism for almost one decade. The cause of extremism and terrorism in Pakistan can be traced back to the fabrication of violent culture in the name of Jihad to promote and secure foreign agenda of one superpower against the other. Later on the 9/11 episode and subsequent American led counter terrorism offensive in Afghanistan, and spill over of militancy and extremism into Pakistan led to destruction of social, economic, and political fabric of Pakistani state. According to South Asian Terrorism Portal (SATP) in 2012, there were 6211 terrorism fatalities in Pakistan, including 3007 civilians, 2472 militants, and 732 Security Forces Personals, as against 6,303 fatalities, including 2,738 civilians, 2,800 militants, and 765 SF personnel in 2011. The first 69 days of 2013 have witnessed 1,537 fatalities, including 882 civilians, 116 SF personnel, and 539 militants. There is a consensus in making that Pakistan needs a holistic approach and strategy to effectively eliminate the menace of extremism from its society. 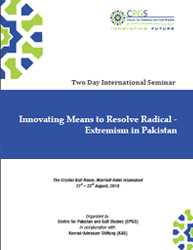 The de-radicalization and counter-radicalization experience of above mentioned countries, in this regard could prove to be a guideline for Pakistani counter terrorism experts to envisage a comprehensive strategy and approach towards elimination of extremism and terrorism from Pakistan. The subject has gained further attention in the context of NATO forces withdrawal in 2014 and the consequent fear of increasing stronghold of radical groups with serious implications for Afghanistan and neighboring countries. Therefore a comprehensive study of emerging scenarios (post NATO withdrawal) and its impact on Pakistan is urgently required. For this purpose Centre for Pakistan and Gulf Studies (CPGS) has taken the initiative to organize a research project “SALAM” “Innovating Means To Resolve Radical Extremism In Pakistan”, which aims at formulating a comprehensive plan of action to first sensitize society, access all possible groups and institutions, link their efforts, act to persuade decision makers and finally manage and monitor the progress. It will include commissioned research studies and surveys, an international seminar and different other activities including establishment of a model institution and center.